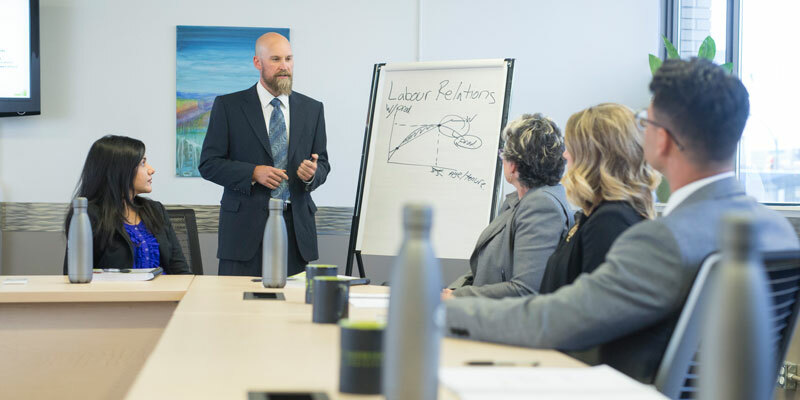 Every year in September, approximately 30 labour relations practitioners join Edwards Executive Education to learn from each other and work with a carefully selected cadre of seasoned professionals and leading academics. Edwards works closely with the business community to bring a balanced combination of academic and hands-on experience into the classroom. At the core is a dedicated group of faculty including Edwards School of Business professors; Daphne Taras, Gary Entwistle and Scott Walsworth, University of Saskatchewan law professors; Beth Bilson and Allen Ponak, as well as University of Toronto professor Dionne Pohler. Now in its sixth year, the Labour-Management Relations Certificate is a five-day intensive program intended for union representatives, human resource and labour relations managers, labour lawyers and consultants, neutrals, and people who operate in unionized environments. “The certificate is an intensive program that challenged [us] and gave a comprehensive overview of all things labour relations,” said 2017 participant Richard Exner, Chief Shop Steward, Unifor 594. While the primary objective of the certificate program is to strengthen the professionalism and effectiveness of the labour relations community in the province, the benefits go both ways. “Every year these busy practitioners join us for an entire week, which I think speaks to the credibility and perceived value of the program,” said Associate Professor and Academic Program Director Scott Walsworth. As a group of academics, Walsworth explained there is also an opportunity to become immersed in the practitioner community. The Labour-Management Relations Certificate also provides an in-road for the academics to join the conversation. “Mostly we listen, grin and scribble down promising research ideas as the participants swap stories and perspectives,” said Walsworth. For those interested in furthering their knowledge in a fun, fast-paced and dynamic learning environment, Walsworth encourages employers and individuals to consider the Labour-Management Relations Certificate program offered by Edwards Executive Education.